An error occured while trying to replace the existing file: DeleteFile failed; code 5. Access is denied. How do I resolve the Access is denied error? This means the installer is trying to replace a file that is currently in use by another program. Close all programs that are active and click on 'retry'. If the same error keeps appearing, then just click on 'ignore' and let the installation continue. 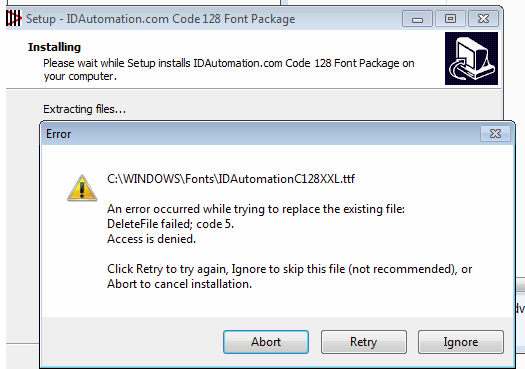 If this does not work, reboot the machine and re-attempt to install the fonts.